So if you follow along on Instagram (@amysoto_) you may have seen a preview post on how there is a lot of Neon happening over here on the blog... AND don't be surprised if more neon spams your feed. What can I say- I am a Neon junkie :). Looking at these pictures I realize I look like a human highlighter - but I love it! I have always loved lots of color and I love incorporating it into my outfits everyday. My love for neon keeps growing because, honestly, it is so versatile! Wearing neon is an instant statement... you can wear jeans a white top and a pop of neon (necklace, bag, or shoes) and you have an perfect spring outfit. Today, I paired a graphic top with a fitted bright skirt and balanced it with neutral accessories ( shoes, bag, watch) . What are your thoughts on Neon!? Beautiful look on you. Love the vibrant colors you mixed together to make this beautiful outfit. Perfect ootd eye candy! Love the chartreuse neon and the shoes balance it out. 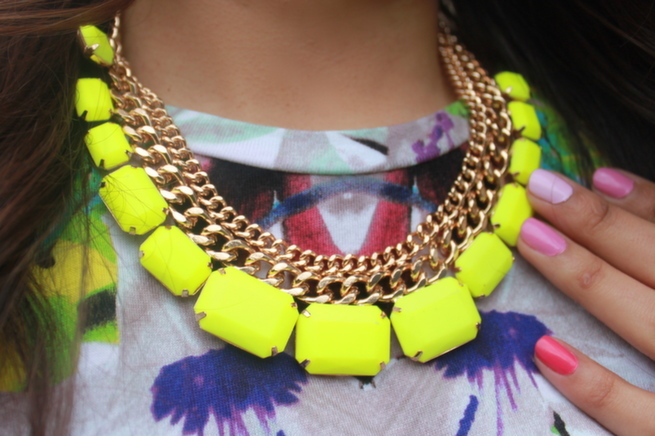 You can never have too much neon, LOVE this look! Neon is my jam :) You look very pretty and bright! love the neon! and the way you toned it down with the neutrals!